Demonstrators protesting Donald Trump’s election as president burn a flag in New York City on Nov. 9, 2016. 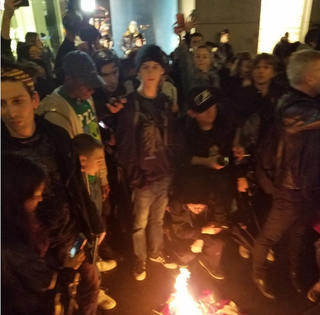 Despite pleas from President Barack Obama and Hillary Clinton asking their backers to accept Donald Trump’s victory and support his transition into power as the president of the United States, people took to the streets Wednesday evening to express their dismay with the election outcome. The Washington Post reports that demonstrators marched through the streets of New York and Chicago, Washington, D.C., along with Austin, Texas, and other cities, to decry Trump’s crude comments about women and his attacks on immigrants. This followed a walkout staged earlier in the day by thousands of California high school students. “I’m disappointed, shocked, a little panicked for my friends and family—for everything that will be unleashed, the hate that will be unleashed,” Marion Hill, 22, one of thousands of demonstrators who gathered outside Trump Tower in downtown Chicago, said in an interview with the Post. The protesters in Chicago carried rainbow flags and signs that read, “Time to Revolt,” as they filled Michigan Avenue and were cheered on by drivers who honked their horns in support. The demonstrators then shut down Lake Shore Drive. In the nation’s capital, the Post reports, a crowd of hundreds that consisted of mostly young people gathered outside the White House for a candlelight vigil before marching to the new Trump International Hotel a few blocks away on Pennsylvania Avenue. Katie Lasso, 57, is the wife of a Guatemalan immigrant and has relatives in the country without proper documentation. She told the Post that she’s trying not to be angry and doesn’t think that anger will help. She’s trying to find more positive ways to express her reactions. Still, she is worried about her family members. Hours before the protests, both President Obama and Hillary Clinton told their supporters not to despair, with Clinton going so far as to say that Trump should be met with an open mind and given a chance to lead. Protesters Wednesday night felt differently, and the displays of anger and grief showed just how deep the rift is in this country, and how much many Americans distrust Trump.